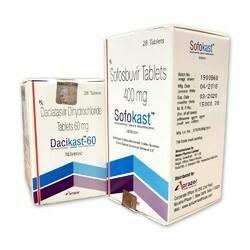 Usage/Application Daclatasvir Sofosbuvir is used in the treatment of chronic hepatitis C virus (HCV) infection. 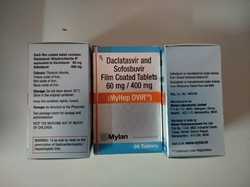 HOW TO USE DACLATASVIRTake this medicine in the dose and duration as advised by your doctor. Swallow it as a whole. Do not chew, crush or break it.HOW TO USE SOFOSBUVIRTake this medicine in the dose and duration as advised by your doctor. Swallow it as a whole. Do not chew, crush or break it.HOW DACLATASVIR WORKSDaclatasvir is an antiviral medication. It works by lowering a load of hepatitis C virus in the body and removing the virus from the blood over a period of time.HOW SOFOSBUVIR WORKSSofosbuvir is an antiviral medication. It works by lowering a load of hepatitis C virus in the body and removing the virus from the blood over a period of time.HEPCINAT PLUS TABLET RELATED WARNINGSAlcoholInteraction with alcohol is unknown. Please consult your doctor.PregnancyPROBABLY SAFEHepcinat Plus 60mg/400mg Tablet is probably safe to use during pregnancy. Animal studies have shown low or no adverse effect on the foetus, however, there are limited human studies. Please consult your doctor.LactationHepcinat Plus 60mg/400mg Tablet is probably safe to use during lactation. Limited human data suggests that the drug does not represent a significant risk to the baby.DrivingDo not drive unless you are feeling well. Some patients have reported dizziness, difficulty in concentrating, and vision problems while taking Hepcinat Plus 60mg/400mg Tablet which may affect your ability to drive. Hepcinat Plus 60mg/400mg Tablet, when taken together with other medicines for the treatment of hepatitis c infection, may produce dizziness, blurred vision and this may affect your ability to drive.KidneySAFEHepcinat Plus 60mg/400mg Tablet is safe to use in patients with kidney disease. No dose adjustment of Hepcinat Plus 60mg/400mg Tablet is recommended.LiverSAFEHepcinat Plus 60mg/400mg Tablet is safe to use in patients with liver disease. No dose adjustment of Hepcinat Plus 60mg/400mg Tablet is recommended. 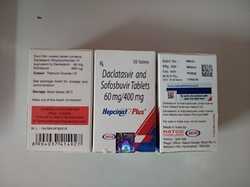 Daclatasvir 400 mg +Sofosbuvir 90 mg is used in the treatment of chronic hepatitis C virus (HCV) infection.